Wretches are a class of Fallen warrior in Destiny 2. They serve the House of Dusk and some of them joined the Spider's crime syndicate. Wretches are two-armed, spear-wielding Fallen who serve under the House of Dusk. These Fallen warriors attempt to charge their enemies with Arc Spears, attempting to both slice and electrocute them. 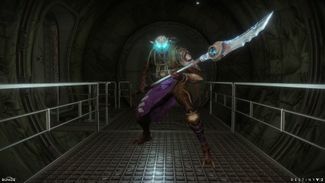 Guardians should evade their spears at all cost, as they hold a longer range than most Fallen melee weapons. Given their fast attack rates and quick movements, Wretches can be difficult to pin down. However, their main weakness is their frailty, allowing even low-powered weaponry to be useful against them. Wretches bear a striking resemblance to the Pfhor Fighters from Marathon, who also wielded spears. Render of a Wretch belonging to the House of Dusk.